In the Hong Kong action movie explosion of the eighties, when the craziest, most kinetically energetic and narratively surreal action movies were pouring out of the Hong Kong studios at a breakneck pace, Jackie Chan’s Police Story (1985) was one of the films that both defined and redefined the industry while firmly establishing Jackie Chan as a worldwide superstar. Everywhere except the U.S.
Chan had been making successful films for years but this was something different. In Hong Kong, he was moving into modern action comedy in Wheels on Meals and adding color, different cultural backdrops, and more spectacular stunts to the martial arts fight movie with Project A (all with his opera school buddies and fellow stars Sammo Hung and Yuen Biao). But Chan had chafed at the way American productions tried to fit him into a generic mold in his bid for a U.S. crossover film, The Protector. He came back to Hong Kong with lessons learned. 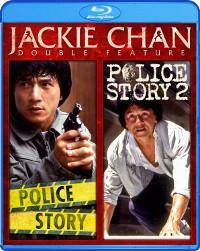 Police Story was his answer to the American action blockbuster and the first of his aggressive appropriations of American hit movies remade as Jackie Chan spectacles. It was modern and urban, filled with gritty action and juvenile slapstick, and it incorporated Jackie’s brand of acrobatic martial arts (with all its comic flourishes) with big budget set pieces and eye-popping stunts. He lavished production value on the film. The story is almost inconsequential, something to do with a case against a mob boss and his drug operation. Ka Kui Chan, a committed officer on the elite CID division of the Hong Kong Police, is assigned to “protect” a reluctant witness (the great Brigitte Lin) and then framed by the mob as a corrupt cop, sending him on the run to clear his name and take out the gang one man at a time. The only logic is kinetic: one action follows another with ingenuity and physical integrity. It opens on mission gone wrong that turns into a car chase through a hillside shantytown reduced to rubble by the careening vehicles smashing through huts and blowing out walls as inhabitants scurry for cover, and it ends with a brutal one man battle with a criminal army in the six-story atrium mall that sends combatants through plate glass windows, down escalators, and over railings. In between is a satire of office politics, a slapstick romance between a smug, chauvinistic Chan and his fresh-faced girlfriend May (a very young Maggie Cheung) — an innocent who gets almost unbearably knocked about for laughs — and an almost non-stop mix of acrobatic set-pieces, physical comedy, and fast and furious fight scenes. It’s the whole raison d’etre for the film and Jackie walks a fine line through the action, which is both potentially deadly and yet much of it played for humor. The cleverness and the comic potential blunt the brutality of the battle. As a director and a savvy manager of his brand, Chan knew what audiences wanted and he delivered in spades. Like his American heroes, Buster Keaton and Charlie Chaplin, he presented his most elaborate and daring fights and stunts in long, unbroken takes, the better to show his fans that he did at all, with no stunt doubles or cheating shots. And then he showed it again, and again, from other angles, to give everyone their money’s worth. And just to prove his credentials, he plays it all again in a closing credits montage, with clips interspersed with behind-the-scenes footage and outtakes from stunts gone wrong.